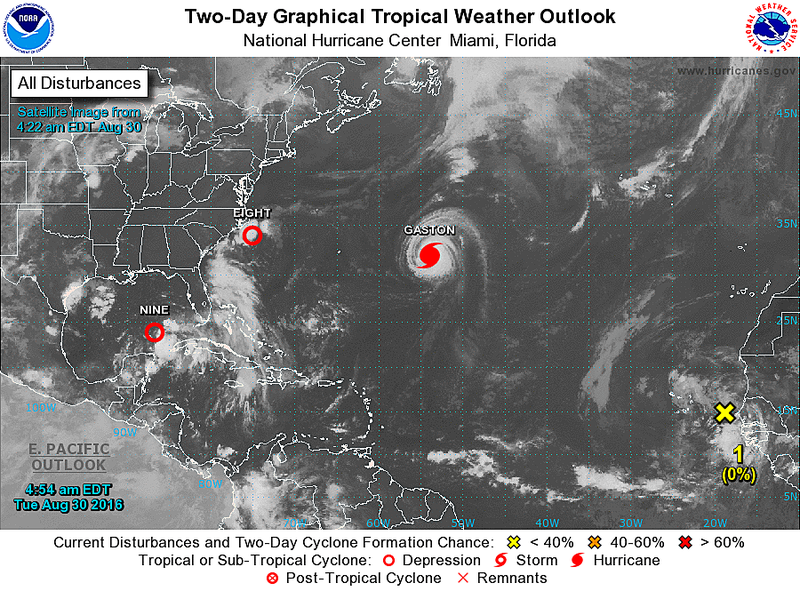 A series of tropical cyclones continues to stir up the Atlantic Ocean, but will only have indirect effects on the Garden State. The tropics are firing up and the Labor Day Weekend is fast approaching... Let's get right into the forecast! --Hurricane Gaston: As Gaston enters the cooler waters of the North Atlantic, the storm's intensity has started to decrease. We're still feeling the influence of a strong hurricane churning up the ocean: the risk for dangerous rip currents, increased swell, and rough surf continues along the Jersey Shore. It's enough to see and feel at the beach, but coastal flooding is not a concern. --Tropical Depression 8: Still a tropical depression, #8 will make a close pass to the Outer Banks of North Carolina on Tuesday. It will then make a sharp right-turn out to sea. There was some concern that the storm could clip southern and/or coastal New Jersey, but that looks pretty unlikely at this point. However, the storm will still contribute to the rough surf conditions along the Jersey Shore through the late part of the week. And if we tap into some of the rich moisture of the system, I'm not ruling out an increase in humidity and enhanced rain from an impending cold front on Thursday. --Tropical Depression 9: Now entering the open waters of the Gulf of Mexico, #9 will set its sights on the Florida Gulf Coast with a likely landfall on Thursday. The storm will then cross the peninsula and push into the Atlantic Ocean on Friday. What happens next is still a bit of a mystery. *Most* forecast models immediately push the storm out to sea. But there are a couple of models and ensemble members that warrant a raised eyebrow for us in New Jersey. Still worth watching, but not worth worrying about just yet. --Tropical Wave: Could be the next tropical system to watch. Now a disorganized blob of rain pushing off the coast of Senegal, Africa and moving toward the Cape Verde Islands. Some models show the storm developing into a threat for the U.S. East Coast by late next week (over 10 days away). But at this point, there's a nearly equal chance it turns into a non-issue. Monday ended up pretty hot across the Garden State, with an observed high temperature of 93 degrees at Newark, Trenton, and Atlantic City. (Triple!!!) A weak front has delivered slightly cooler and drier air for Tuesday morning, and we'll enjoy mostly nice weather for the next couple of days. Tuesday morning's temperatures show a pretty wide spread, due to the presence of relatively dry air in North Jersey and humid air to the south. Thermometers are starting out in the mid 50s in NW NJ, with mid 70s along the coast. It should turn into a nice late August day, with inland high temperatures in the mid 80s. We should end up around 80 degrees along the coast. We'll enjoy sunny skies to start, but a band of clouds is expected to pass through central and southern New Jersey through the afternoon hours. As those clouds thicken up, and with that tropical depression "moisture machine" south of New Jersey, I don't want to completely rule out a stray late-day shower. Again, the chance is slim, but non-zero. Humidity will likely be noticeable overnight in South Jersey and along the coast. (Again, a mild long-distance effect of that tropical depression.) Low temperatures will therefore stay above seasonal normals, generally in the upper 60s to lower 70s. Wednesday daytime looks pleasant and summerlike as well, with mostly to partly sunny skies and very warm high temperatures near 90 degrees. By Wednesday night, our next cold front will approach New Jersey. And it looks to bring us a prolonged period of rain. Starting about 10 p.m. Wednesday, rain and thunderstorms could last through much of Thursday. Rainfall totals are generally light to moderate - less than an inch across New Jersey - but it does look pretty persistent. Bottom line, Thursday could be pretty wet overall. The end time of the rain is also a bit in question. The NAM pushes the final bands of rain off the coast around 2 a.m. Friday. The GFS is faster, drier out the Garden State around 5 p.m. Thursday. In any case, it looks like dry air and high pressure will take over our atmosphere for Friday and the majority of the Labor Day Weekend. With near-perfect sunshine and a stiff northerly breeze, Friday will be a bit on the cooler side for this time of year. Highs look to range from about 75 and 80 degrees. Upper 70s will be the general rule for Saturday and Sunday of the holiday weekend too, with lower 80s and a few clouds returning for Labor Day Monday. I'm not sure it's going to be quite warm enough to qualify as ideal beach weather, especially considering the rough surf concerns. But I'm certainly not complaining about 70s and sunny skies!